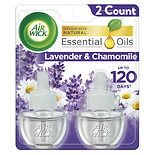 Air Wick Scented Oil Refills ....67 oz. 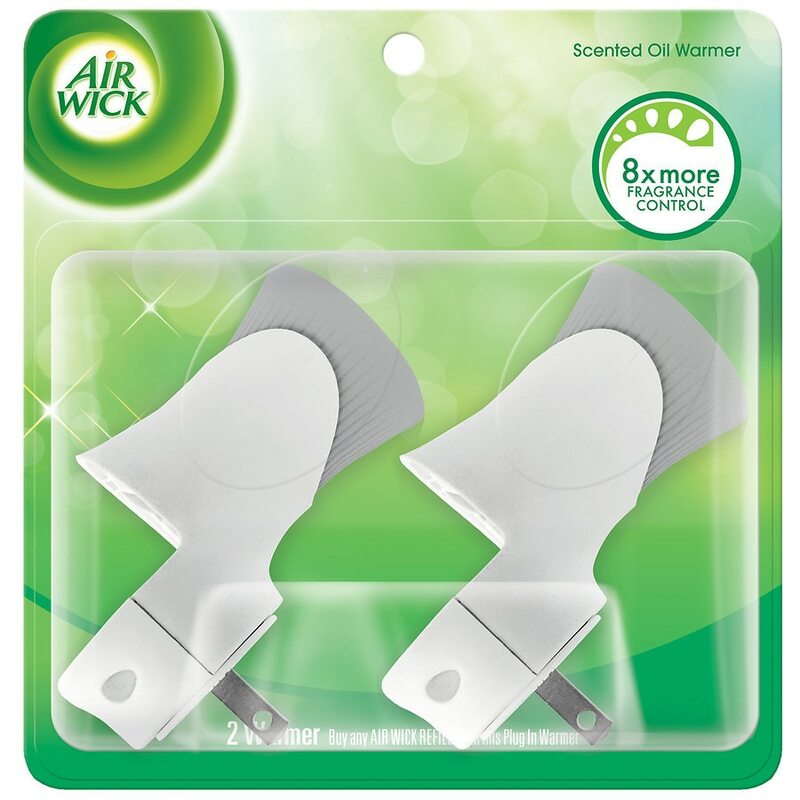 Air Wick Scented oil warmers add a long-lasting fragrance to any room in your home. These warmers continuously diffuse wonderful fragrances throughout your home, brightening your world. The warmer's advanced design allows you to adjust the fragrance level as needed, and its sleek look complements any home decor. For convenience, the rotating plug can be adjusted to avoid blocking a second wall outlet. When the warmer runs out of oil, simply replace with any Air Wick Scented Oil refill (sold separately). Adjust the fragrance level to create the perfect ambience for your home. This Air Wick Scented Oil Warmer comes with three settings. Simply rotate the dial on top of the warmer to the desired setting and the scent will be diffused throughout the room. With its convenient rotating plug, this warmer utilizes only a single wall outlet, leaving your second outlet free. The sleek white design matches any home decor. Unwrap the pack and insert the fragrance bottle into warmer by pushing up into the device until you hear the click. 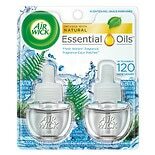 When your refill runs out of oil, you can simply replace it with any Air Wick Scented Oil. Remove the old fragrance bottle and insert the new one. Please read safety instruction on the back of the pack before using it. Developed in 1943, Air Wick was one of the first odor eliminators and left homes across America smelling clean and fresh. 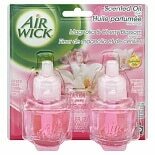 Today, Air Wick products are available in a variety of formats and fragrances, from robust automatic sprays to indulgent candles, so you can ensure your home always smells fresh and inviting and creates just the right atmosphere to enhance your mood. Unscrew cap from fragrance bottle. Insert fragrance bottle into warmer by pushing bottle up into device until click can be heard. Plug warmer upright into outlet. Rotate plug if necessary. Unit will leak if plugged in sideways or upside down. When unplugged, keep unit upright. To adjust fragrance intensity, rotate dial on top of warmer unit. Largest dot = max. setting. Cleaning instructions: Fragrance oils may collect on warmer unit over time. To clean warmer unit, remove from electrical outlet and wipe with dry cloth. Replace fragrance bottle when empty, by gently pulling bottle down from unit. Keep out of reach of children. Risk of electrical shock. This product is not a toy. Intended for adult use only. Use only in properly functioning 120 volt electrical outlet. Do not use with extension cords. Do not place fragrance oil bottle or cap on finished wood surfaces or place any object within 12" (30 cm) above warmer. Do not plug anything in above it. Do not disassemble or modify unit in any way. 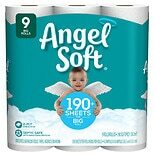 Only for use with Air Wick Air Freshener refills. Reckitt Benckiser will not be held responsible for damage, injury or poor performance caused by use of any other refills in Air Wick warmers.